Every home has endless iron work possibilities. 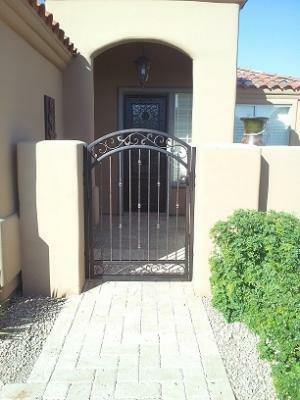 Look at these exquisite iron gates leading up to these beautiful homes in Glendale Arizona. 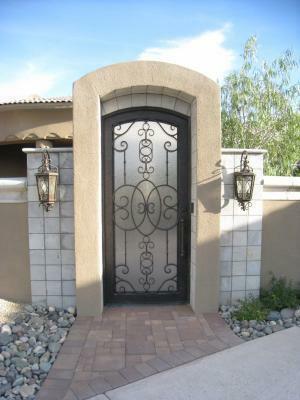 Although a global business, Phoenix Arizona is Signature Iron Doors central location. Our large showroom is located just off of Southern and 40th st. These homeowners were recommended to us by their builder and set up a time to meet with our sales team and view our showroom. They wanted an iron gate to open up to their walkway leading to their iron entry door. After viewing a variety of designs, one family felt this Cortina design fit their home best while the other went with a custom design. All of their iron pieces were built to complement each other with this same design. Signature Iron Doors continues to fulfill iron needs everywhere with our high quality doors. All pieces are hand forged and finished to endure all conditions. It’s our belief quality is in the detail, so our managers oversee the production of each door to insure it’s built flawlessly. Call us and come visit our showroom in Phoenix Arizona off of Southern and 40th st to find out about your iron door and gate options.